View all 78 products in this collection. Inspired by "the Parisian's Lifestyle," the fashion jewelry and timepieces of Elle are every bit at elegant and beautiful as the designer's legendary namesake. A one-of-a-kind merging of contemporary and classic styles, Elle women's jewelry is made to celebrate their wearer's individuality while shining with a chic, high-fashion glow all their own. Comprising of rings, charms, earrings, bracelets, necklaces, and watches, the Elle items available today at Rumanoff's Fine Jewelry are made with top-quality materials including 925 sterling silver, palladium, as well as an array of beautiful semi-precious gemstones. Located in Hamden, Connecticut, Rumanoff's Fine Jewelry has long been New Haven's leading source for exquisitely-made designer pieces, including the beautiful fashion jewelry and timepieces of Elle. 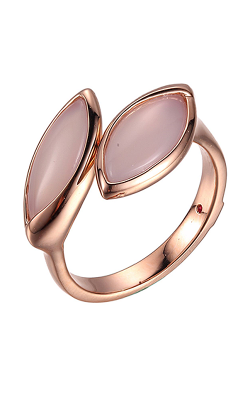 Included in this spectacular selection are the Elle fashion rings of the Promises, Revolution, Ocean, and Bouquet collections, which make the perfect complement to any modern woman's ensemble. Further, from the Mystere, Sunrise, and Essence lines come pendant style necklaces of exquisite, hand-crafted quality. Also available now at Rumanoff's Fine Jewelry, the bracelets and charms of Elle's Glacier, Humanity, and Lattice collections are the perfect gifts for a loved one - or just for yourself. In addition to this women's jewelry collections, also from Elle comes a wide selection of accurate and fashionable Swiss-quality ladies' timepieces. 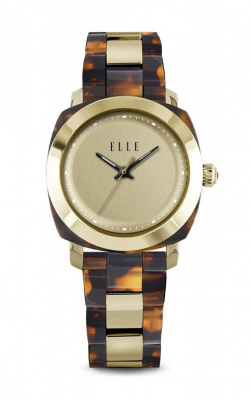 Made of gold plated stainless steel, mother of pearl, and genuine leather, the women's watches of Elle are bright, bold, and perfect for the modern on-the-go woman. On display in feminine models ranging from classic to modern, Elle watches are built to be every bit as precise as they are eye-catching and unforgettable. Great for keeping the wearer in style and on-trend, finding the perfect Elle women's jewelry or watch is simple today at Hamden's own, Rumanoff's Fine Jewelry. Why Shop ay Rumanoff's Fine Jewelry? With over 80 years of industry experience, Rumanoff's Fine Jewelry is your family-owned and operated source for an amazing selection of 100% authentic engagement rings, wedding bands, fashion jewelry, loose diamonds, and Swiss-made timepieces. Family-owned and operated, the Hamden, Connecticut showroom of Rumanoff's Fine Jewelry is absolutely filled with an amazing assortment of pieces from some of today's most popular designers including Tacori, Fana, Verragio, Forevermark, Hearts on Fire, Madison L, Alex and Ani, and others. Additionally, to ensure generations of fine jewelry glow, Rumanoff's Fine Jewelry also extends jewelry and watch repairs, custom design services, as well as quick on-site appraisals, gold buying, and financing options.